Before things cool down tomorrow, at least according to the esteemed John Coleman of KUSI weather, we have another hot day today at the Aztec Student Union site. The temperature is already in the mid 90s, and it could topple the 100 mark like it did yesterday at 2:46 p.m.
*If you get hot, find shade. A shaded area is adequate when it blocks all direct sunlight and has room to assume a comfortable posture. In areas where no natural shade from structures or trees exist Sundt will provide portable shade structures for breaks and for rest periods as needed. *Drink water frequently to keep hydrated. Drink up to one quart of water per hour per person. Sundt will provide water, cups and waste cans for all Sundt employees on site and replenish as needed throughout the shift. 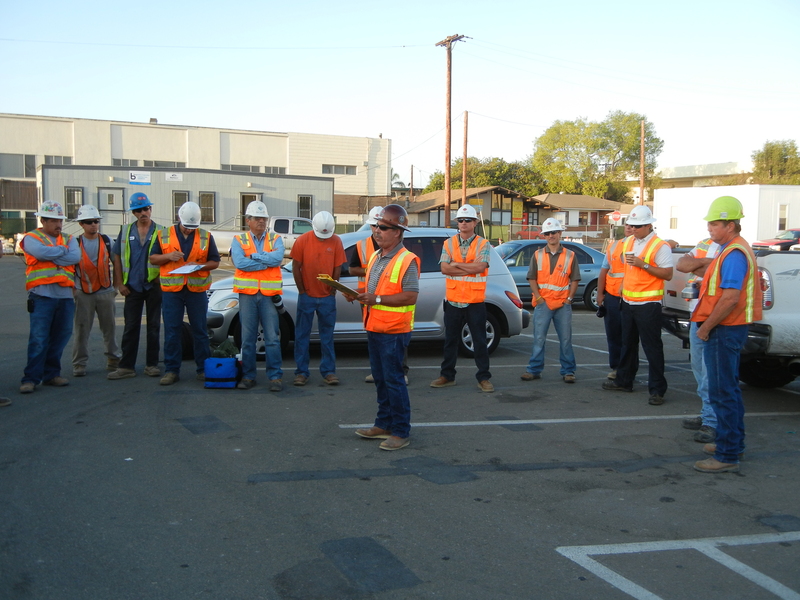 Superintendent Mike Pontius leads a safety briefing every morning at 7:00 a.m. that includes heat prevention reminders.